The completion of a business expansion project in eastern Iowa will be celebrated this afternoon. 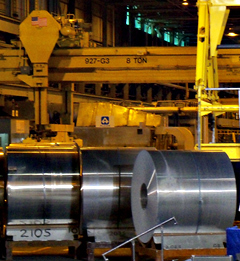 Governor Terry Branstad will be among those attending a 2 p.m. ribbon cutting at the Alcoa plant in Riverdale. Plant spokesman John Riches says construction on the $300 million addition began two years ago. The company wants to increase its capacity to produce aluminum sheets for the auto industry. “That’s an important thing for them because customers are asking for improved fuel economy and the government, through their CAFE (corporate average fuel economy) standards, is requiring the auto makers to increase their fuel economy,” Riches said. Hoods and some trunk lids are now made from aluminum, but soon most if not all of the exterior panels will be made from aluminum as well – including doors, roofs, and quarter panels. The expansion at Alcoa is expected create 150 jobs and help retain 200 more. The average car now contains 343 pounds of aluminum. Riches said by 2025, that average is expected to increase to 550 pounds. The Iowa Economic Development Board, in 2012, awarded Alcoa with an incentive package that included $3 million in direct financial assistance.